I love getting an email or a letter from a friend. As my eyes read the words, my heart begins to hear the voice of the person behind the letter. I hear their laughter or their sorrow. I hear their sarcasm or their humor. I hear their delight or their disgust. I hear their excitement or their worry. Their letter is more than just words on a piece of paper. It is them....speaking to me...through these words. I know the sound of their voice, and sometimes, as I read their letter to me, I can almost "hear" their voice. The time I spend reading their letter is not grievous. It is not boring. It is not something I do just because I feel like I have to. Quite the opposite. I am excited each and every time I receive a letter from someone dear to my heart, and usually, this letter will interrupt whatever I am doing. I stop, right then and there, and read the words of my friend, or the words of my sister, or the words of my God. Yes, the words of God. Once you have fallen in love with Jesus, His Bible becomes as dear to you as the written word of someone you love. When I was a child, I was told the Bible is God's love letter to us. I have to say I never really "got that" until the Holy Spirit showed up in my life. Thanks to my mother, from my very existence, I have known about God. My mother faithfully took us to church each and every week. I heard Bible stories, memorized scriptures, and sang hymn after hymn. Thanks to my mother, I had a solid Christian foundation from the beginning of my life. This foundation held me up through my teenage years and even into adulthood. My knowledge of God kept me from harm, helped me to pursue "right" paths and influenced decisions I made. I am so thankful, that from a child, I knew the scriptures and I knew about God. As time went by, however, I discovered knowledge was not enough. It gave me direction and a path to follow, but it didn't satisfy my soul. It kept me anchored and grounded, but it didn't meet my inner most needs. It had introduced God to my head, but not to my heart. Then, the Holy Spirit came into my life. My longing for something more, for something real, for something passionate and personal, led me to my knees. I prayed for God to make Himself real in my life. I didn't just want religion, I wanted a relationship with Him. 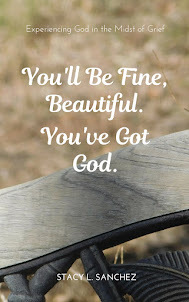 I wasn't satisfied to simply have God in my head, I wanted (and NEEDED!) Him in my heart. God wants us to know Him. He desires that we enter into a personal, intimate, passionate, relationship with Him. This is why He sent His one and only son, Jesus, into this world and into the life of you and me. To give the light of the knowledge of the glory of God. Jesus in the Way, the Truth, and the Light. It is through Jesus that we have access to the Father. It is in the face of Jesus that we come to know the face of God. It is in the face of Jesus that we find love, compassion, forgiveness, joy, peace....... It is in the face of Jesus, through the power of the Holy Spirit, that our head knowledge finds it's way to our heart. My early childhood foundation introduced me to God. It was the face of Jesus, though, that captured my heart. Now, when I read God's word, it is HIS voice I hear. No more are the words written there simply words of instruction or guidance or correction. Now, they are words of love. As I read the scriptures, I hear His heart. I hear His joy. I hear His sorrow. I hear His voice....guiding me still. I hear His love for me. I hear His delight in me. I hear His voice. Maybe, like me, you grew up with a knowledge of God. Praise the Lord! Maybe, like me though, you now desire more. Do you have a burning desire to truly know God? Do you want a deep, passionate, personal relationship with God? Seek Him. Spend time in prayer talking to Him and listening for His voice. Read His word in a spirit of prayer.....listening for His voice to your heart. Ask God to send His precious Holy Spirit into your heart. It is the Holy Spirit that reveals God to us. It is the Holy Spirit that opens our eyes to see God in the face of Jesus. It is the Holy Spirit that leads us and guides us into ALL truth....truth that goes beyond our head and into our heart. It is the Holy Spirit that re-creates us and births us anew into a living, breathing, life-changing relationship with Christ. I no longer have religion.....I have a relationship. I no longer have a book of scriptures, I have a love letter written by God with me in mind. I have a letter from the lover of my soul. I have a letter from my dearest friend. I have a letter from one who knows me like no other, and who loves me like I have never been loved before. I have Jesus!! !